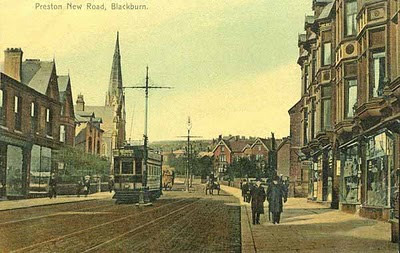 BLACKBURN PAST: Preston New Rd - Spot the difference. 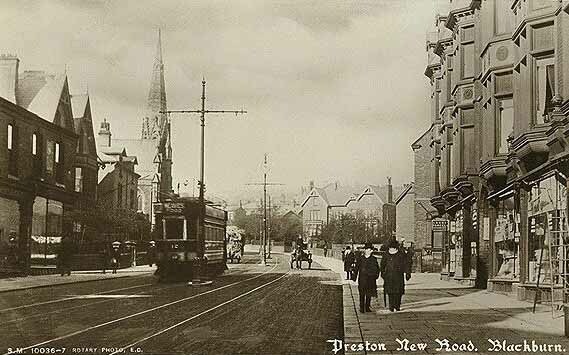 Preston New Rd - Spot the difference. This is the bottom section of Preston New Rd, just up from Sudell Cross. 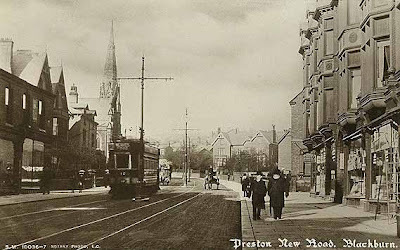 The tram is passing the junction of Alma Street and the church beyond it is St George's, which was on the corner of New Park Street. At a guess, I would say the date is circa 1910. These two images are obviously the same photograph, but please notice how in the coloured postcard, the step ladder on the extreme right of the image has been conveniently omitted. Not only have the Step Ladders been removed from the postcard image, but the artist has also put some Curtains in the uppermost windows in the buildings on the right, and the Tram now has a pole on it's roof connecting it to the overhead power cable.These Trams terminated just before the junction of Preston New Rd and Billinge End Rd.